Showing 21 articles from March 28, 2016. This spring, Timberland Regional Library teams up with the Small Business Association (SBA) to provide a series of "Start Smart" workshops for small businesses and entrepreneurs. The workshops pull together experts from the SBA, its partners and Timberland libraries to provide free 2-hour seminars. Workshops will be held in Aberdeen, Chehalis, Oakville, Raymond and Tumwater. An emergency temporary fix has gone underway for erosion issues along the Westport by the Sea condominium complex property. Beyond Survival is offering a workshop Where We Live. This is your chance to nominate a person who has made the Elma community a better place! If you know an individual or individuals who work tirelessly and give of themselves to help others, or improve our community in other ways, this is your opportunity to insure they are recognized. Citizen of the Year awards recognize outstanding, service-minded individuals that have exceptionally impacted the Elma community. Citizen of the Year awards will be presented on April 29, 2016 at the Elma Citizens Award Recognition Banquet. This fun evening, to be held at the Elma Eagles Banquet Hall, will include a prime rib dinner, entertainment and silent auction. Due to multiple inquiries about what should be done with bud tender's tip jars, the Washington State Liquor and Cannabis Board has reviewed their stance on the protocol of bud tender's tip jars. On Monday, February 29 Aberdeen Patrol Officers were dispatched to a report of a two vehicle collision with injuries at Curtis and Boone. One of the vehicles had failed to stop at a stop sign, causing a collision with the second vehicle. On Friday, March 25 the Grays Harbor Mounted Posse will hold an Indoor Pro Rodeo at the Grays Harbor County Fair Grounds starting at 7pm. There will be bulls, broncos, vendors and food. Coho salmon are also know as silver salmon due to their bright shiny skin while in the ocean. They change color as they swim up the rivers to their spawning grounds. Poor forecasts for returning Coho salmon are prompting state and tribal fishery managers to consider closing all salmon fisheries in Washington's ocean waters this year as part of a federal season-setting process for the west coast. Photo By Brandon Patching - The ribbon cutting ceremony of the Rowdy Rooster Deli on Friday. Mayor Lonnie Dowell (left) holds the ribbon with WIN President Fred Terry (right) while owner Chuck Sonner (middle) cuts the ribbon. 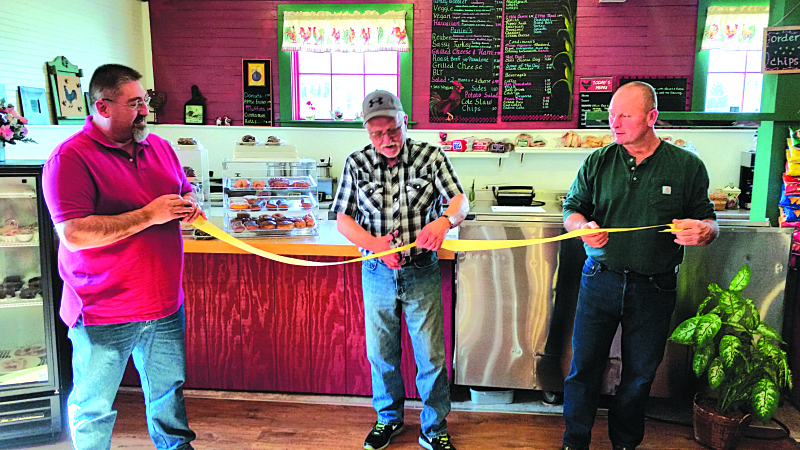 The Rowdy Rooster Deli had their ribbon cutting ceremony on Friday, March 18th at 2:00 PM. Since opening on Wednesday, March 9th, the business has been met with a flurry of customers. Photo by Josie Bowen - Alfonso Carpenter throws his 118 foot discus, earning him a spot at first place. Led by a pair of first place finishes from Courtney Moore, the Toledo Indian girls track team placed first in their opening meet at South Bend. There were six schools present: Toledo, South Bend, Tacoma Baptist, Rainier, Life Christian Academy, and North River. On Monday March 14th, the Winlock city council was called to order at 6:30 PM. Photo Courtesy of Donald Helvie - From left are Raymond students Kendra Dunsmoor, Myranda Heckard and Mikayla Collins. They finished first in a Regional match competition and are now headed to State. The Raymond High School Math Team, sponsored by the Raymond Schools Foundation and Gear-Up, went to Tumwater for the 2016 Regional Math Contest on March 8th. SOUTH BEND - Shane K. Bryant, 25, of Ocean Park entered a guilty plea to possession of methamphetamine with the intent to deliver and was sentence to five years in prison. The City of Raymond has a new Public Works Director, Eric Weiberg, who is originally from Pacific County. Photo by Larry Bale - South Bend's A.J. Sanchez won his heat and then finished second in the 100-meters sprint last Thursday at a meet hosted by SBHS. The Indians and Lady Indians travel to Raymond Thursday at 3:30 pm. 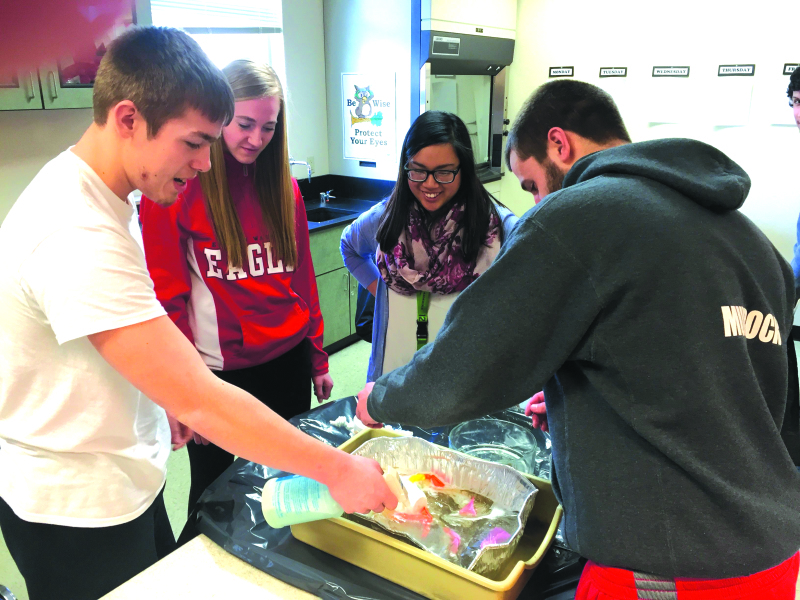 As part of their marine biology science class, Raymond High School students study "point source pollution" and methods for coping with oil spills. The Raymond City Council met Monday, March 21. The council started the meeting with the pledge of allegiance before moving to communications, where Clerk/Treasurer Hester Gilleland had an item regarding the EWC, they are calling for anybody that is interested in being on their board of directors to apply.